Finely shred enough orange peel to make 1/2 teaspoon; set aside. Remove the remaining peel from orange and section orange over a bowl to catch juice. Measure 2 tablespoons of the juice. Set the sections aside. In a medium mixing bowl stir together orange peel, the 2 tablespoons juice, the yogurt, sugar, and salt. Mix well. 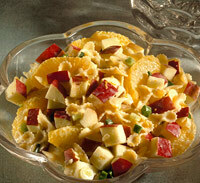 Add cooked pasta, chopped apples, and sliced green onions; toss to coat. Gently stir in orange sections. 3 Comments on "LOW FAT FRUIT AND PASTA SALAD"
I really enjoy your recipes and your site is lovely. Well done. Hi Rachel, nice to have you visit! Your blog looks like fun too and Ill definitely be poking around. Are you on Facebook?